Full time travel is amazing…and also, as it turns out, difficult. Considering a life of full time travel? In honor of our one year travelversary here is our roundup of lessons learned after one year of travel. Have a plan! Just don’t be afraid to dramatically change that plan. This was the first, and probably biggest, lesson we learned on the road. Some of you may remember that we started traveling on bicycles. Yes, bicycles- the two-wheeled, human-powered variety. Our original plan was to bicycle from Oregon to Mexico, where we would camp on beautiful Mexican beaches, and drink gallons of margaritas. However, about 500 miles into our cycling we realized that it just wasn’t working for us. Indy hated the traffic, we were struggling to pull a 75 pound trailer up endless steep hills along the Pacific coast, and, above all, we just weren’t having any fun. So, we decided to dramatically change our travel plan. While staying with a friend in Santa Cruz, CA we jumped on Craigslist to search for campers, and our Toyota Dolphin popped up at the top of the list. We were the first people to look at it, and we bought it on the spot. A couple days later we were back on track, beelining for those Mexican beaches and margaritas we’d been dreaming about! It turns out that living in a motorhome in Baja is absolutely ideal, and we spent an incredible 5 months wandering from beach to beach, snorkeling, and (of course) drinking gallons of margaritas! Had we stuck with our original plan we may have never made it to Mexico, and we may have never even considered living in a camper. So don’t be afraid to turn the plan upside down every once in a while! Stop to see that thing or take that picture! One major difference between full time travel and vacationing is the time available to you. When you’re on vacation there is an end date in sight, and you want to make sure you see everything on your list. This often means that you skip over smaller, less popular travel spots. Once you start traveling full time there is no end date in sight, which means you definitely have time to pull over at that roadside farm stand, or stop at a viewpoint for a photo. It took us at least a month to shift from vacation mode to full time travel mode. We would skip right by some beautiful sights in order to reach the next point on our map until we realized that we didn’t need to do that. Full time travel really is about the journey more than the destination. Read more about how we embrace change and live in the moment. This may be the most valuable lesson we’ve learned over the last year. We sold nearly everything we owned before we began traveling- books, clothes, furniture, a car. You name it, and we probably unloaded it. The process of shedding our belongings was pretty emotional- sometimes freeing, sometimes terrifying. I think we both wondered how much we would miss our stuff. Amazingly, we don’t miss any of it. Literally not one thing. And THAT has been an enormous life lesson for the two of us. Everything we need to live happy, full lives easily fits in our camper. We don’t need a closet full of clothing, we don’t need hundreds of books (we read constantly, but use the Kindle app and tiny libraries for swapping books), we don’t need a crock pot (yes, I said it). Motorhome life turned us into minimalists, and it’s awesome! Knowing how little we need to feel fulfilled gives us so much freedom. From a financial perspective we can save far more because we’re spending less on stuff. From an emotional perspective we no longer attach much value to physical things; instead we value experiences. Some people will never understand what you’re doing, and that’s okay. Full time travel is an alternative lifestyle. Period. That’s the reality of it, and just like any alternative lifestyle there are going to be plenty of people who just don’t get it. We’ve gotten a number of funny looks when explaining our travels to strangers. 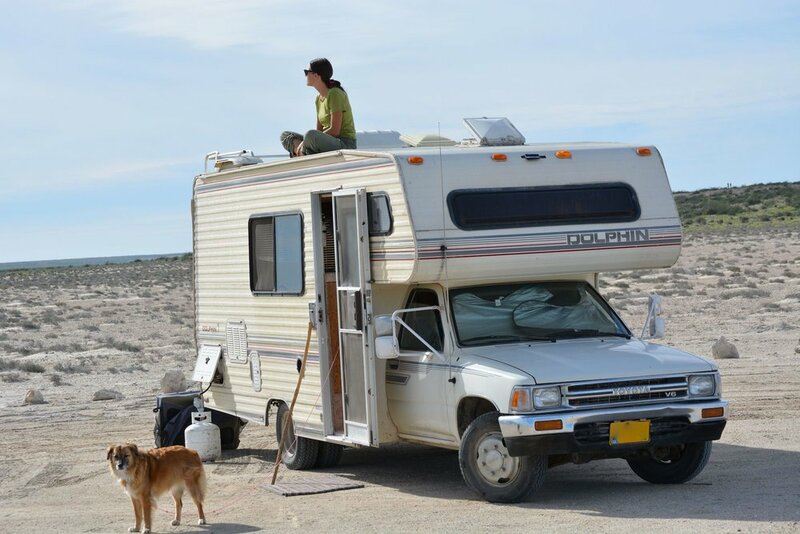 We met snowbirds in Baja who, despite the fact that they RV across America every winter, became markedly uncomfortable as soon as they heard we did not have a permanent residence to return to. We used to take those reactions pretty personally. It’s unnerving to feel like someone is making a snap judgement about you. Over time, however, we’ve realized that those judgements aren’t about us at all, they are about the person making the judgement. Full time travel can be threatening to people for a number of reasons- it’s bucking social norms, it’s dropping out of the rat race, and, just like everything else, it’s not for everyone. Nowadays when we get a funny reaction to our lifestyle we just shrug it off and move forward. You can’t please everyone, and we’re not going to waste our time trying to! Take time every day to appreciate the life you are living. Honestly, this idea was one of the major motivators for our travels. Before we began traveling we just didn’t feel like we were able to appreciate our day to day lives the way we wanted to. Shifting into a life of full time travel required some big sacrifices- we have less money, fewer belongings, and less stability. However, what we gained was so much more time, more freedom, and far more unique experiences than we ever had in our stationary lives. Every day we take the time to appreciate the lives we’re living, and there’s so much to appreciate! Whether we’re sitting next to a glacial stream (I’m listening to it bubbling right now! ), or laying on a beach watching dolphins swim by, or simply waking up without an alarm clock, this lifestyle constantly reminds us to appreciate our lives. To read about some of the amazing locations we've visited check out our guide to camper travel in Banff & Jasper National Parks or read about the time we camped on the shore of a gray whale lagoon!